Nutty Bingo Casino will then reward you with a bonus (Welcome Bonus is for new players only). The terms and conditions of the bonuses vary between different casinos and might also change over time and between different countries, so it is important to compare the different offers and read the T&C for Nutty Bingo Casino before signing up. One of several gaming hubs operated by Cassava Enterprises (Gibraltar) Limited is Nutty Bingo which was founded in 2011. The software comes from Dragonfish and the licenses from the UK Gambling Commission and the Gibraltar Gambling Commissioner. Nutty Bingo’s website is very colourful and is most likely inspired by all the colours of the rainbow. It welcomes new players with ‘Welcome to the Nuthouse!’, announcing the great, fun time they will have playing games of chance at NuttyBingo.com. The variety of games at Nutty Bingo is indeed limited, focusing mainly on slot lovers and bingo enthusiasts. 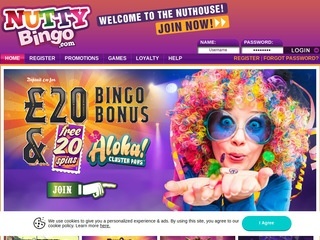 The term ‘Nuthouse’ also applies to the exclusive bingo room available on site, where stakers can play free bingo and count on instant wins in return for real money wagers. Nutty Bingo offers diverse bonuses and promo rewards, as well as loyalty prizes, and they help raise the profile of the site. Nutty Bingo can be accessed on mobile and tablet devices just as easily as on the desktop. All the players have to do is type in the website address and the mobile version will be displayed through the mobile browser on any smartphone or tablet device. As long as you’re online you can keep playing all your favourite bingo and slot games. Where do they come from? 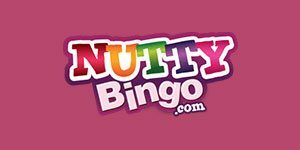 As mentioned, Nutty Bingo is a part of the Dragonfish network, which means it contains games made by such developers as Scientific Games/WMS, NetEnt, Pariplay, IGT, Eyecon and Amaya Gaming. Bingo takes the center stage, but there is no shortage of slot games on site either. As for other types of casino games, Nutty Bingo passes the opportunity to include them into its portfolio, for now. It is quite simple to access the games on the platform – just click on the Games button in the main menu bar and you will see options like Bingo, Coverall Jackpots, Progressive Jackpots and Featured Games (slots, basically). The slot machines available at Nutty Bingo are diverse enough, considering there aren’t as many of them as one might want; there’s less than a hundred titles on display and some of them are widely known while others aren’t. But that’s okay because quality games will always find their audience. Some of the slots you can play at Nutty Bingo are Starburst, NetEnt’s all-time favourite, Cleopatra, Shaman’s Dream, Fruit Shop, Paradise Reels, Super Nova and Sands of Fortune. You can also spin the reels of Temple of Isis, Shopping Spree, Bruce Lee 2, Mermaid’s Perl and Elements. If you fancy a game of blackjack or a roulette session you will have to visit another gaming website, because Nutty Bingo may be nuts about bingo and slot but it’s not about table games. These types of gaming items are unavailable, as well as poker, baccarat and other parlor games in their virtual variations. Although the site claims to offer scratch cards and there are reports of keno-style games, we were unable to find them on the website. Their precise location remains a mystery. On the other hand, you can find bingo games on every step and behind every corner. Nutty Bingo offers 90-ball, 75-ball and High-5 bingo games. Players can find detailed instructions on how to buy bingo tickets and how many of the available games work. The Nuthouse bingo room is open between 7 pm and 9 pm every night, in partnership with BingoPort.co.uk, and games like Million Pound Sliding Jackpots, Zodiac Bingo, Grab A Grand, Sure Win and Wow Bingo are also available. There is no possibility of playing live dealer games at Nutty Bingo Casino. The site lacks virtual table games, and it would be a bigger stretch to expect it offering live casino. One never knows what might happen in the future, but for the time being the focus at Nutty Bingo remains on attractive slots and outstanding bingo games. The banking policy at Nutty Bingo is described in detail on the Terms and Conditions page. Up to 5 different banking methods are allowed per player/account. Accepted deposit and withdrawal methods include Visa and Mastercard credit cards, EntroPay, Bank Wire, Neteller (available to UK members only), Visa debit card, PaysafeCard, PayPal and Apple Pay (available to UK players only). You can use a toll-free telephone number to arrange a financial transfer, as well. The minimum deposit is £5, as well as the minimum withdrawal. Cashing out usually takes 4-5 business days, even longer if you choose Bank Wire Transfer. Nutty Bingo has superb customer support options, starting with instant help which is available between 10 am and 2 am. You need to go to the help room through your account and get in touch with one of the representatives on standby. Should you decide to send them an email, you can expect a reply within 72 hours. Alternatively, you can use a toll-free UK number and speak with phone support agents between 10 am and 2 am or read the FAQ page and stay up to date with frequent doubts and issues any fellow gamers may have.